After an excursion to Spain’s North-West last week, Spanish-Language Literature Month takes us back to Mexico today, with my third review from the country this month. Once again, for those of you with Women in Translation Month in mind, it’s by a female writer, and it’s less a novel than a story of the life of a writer, a woman looking back at her formative years (from a rather comfortable vantage point…). My life was divided between two worlds: that of morning, built mostly out of sounds and smells, but also of hazy colors; and that of evening, always freeing, yet at the same time, overwhelmingly precise. It’s clear from this beginning that it all left a major impression on the life of the writer (or narrator, or character), even if she is eventually able to leave the patch behind. A few weeks ago, I looked at Eric Dupont’s Life in the Court of Matane, a book that detailed the youth of a bookish boy, and The Body Where I Was Born is a very similar work in its structure, even if the two writers’ experiences are rather different. 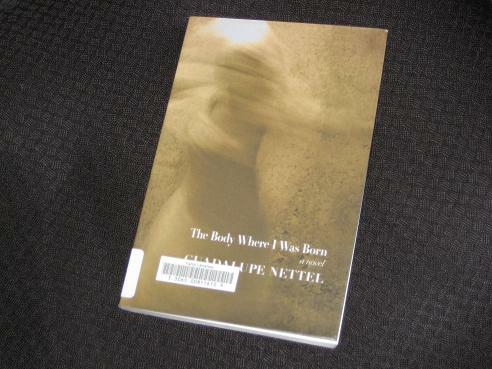 Where Dupont skims over some of the more distressing periods of his childhood, for the most part taking a humorous approach, Nettel explores hers in more detail, slowly recalling the pivotal events of her youth. The story is ostensibly for her therapist, but in truth it’s a way for the writer to reexamine her past and the effect it’s had on her present. The major figures in this past are, of course, her parents. Their hippy ways, open discussions on sexuality and even a trial visit to a commune are bound to leave an impression on a sensitive child, and the more we learn, the more a certain Philip Larkin poem comes to mind. Of course, all of this is nothing compared to what happens when her parents split. The separation and the father’s virtual disappearance (first overseas, then on a slightly less pleasant extended stay elsewhere…) cast a shadow over the protagonist’s life. Life with her grandmother, then, comes as a shock to the system; after the confusing freedom of her family home, the young girl is confronted with the strictures of a rather more bourgeois upbringing. The sense of confusion and isolation settling over her is only increased by being shut up at home in (stifling) security, and she begins to rebel, discovering forbidden literature and using football to escape her sadness. What comes together from all these anecdotes is a picture of a girl becoming a young woman who struggles to find her place in the world, not really sure who she is or where she belongs. The Body Where I Was Born is an interesting novel, a rolling monologue and a flowing text providing insight into the pains of a girl’s youth. The protagonist begins to discover her sexuality and works on establishing an identity for herself from amongst the chaos of her home life. It’s obviously a very personal work, a female Bildungsroman, and many readers will identify with the writer/narrator, yet I’d have to say this is not a book I loved. Quite apart from a collection of clumsy typos and errors – Santa Clause, dolled out (doled out), cuttlery, German Sheperd -, there are several weak aspects to the book. For one thing, the therapist angle is a contrived attempt to justify the confessional nature of the work, but it feels forced and unnecessary, adding very little to the book. Also, the ending feels rather rushed, as if the writer wasn’t quite sure how to pace the final years of her youth. There is an appropriate rounding off as we return to the theme of the girl’s eye, yet it doesn’t really make for a convincing ending. Marina Sofia – Not a bad book, I was just expecting something more – and I was comparing how I felt about it to my enjoyment of the Dupont book (which will get approximately 0.01% of the publicity this has got!). I wasn’t entirely convinced as I read your review so your conclusion was almost a relief. It’ll be interesting to see how you feel her ‘fiction’ (as his is largely autobiographical) compares. I appreciate the skeptical eye of the reader here: as there are some flaws in Nettel’s book, the most obvious being the contrived use of the psychoanalyst. However, in your critique of Nettel’s work, you make the startling mistake of focussing on the typographical faults of her TRANSLATOR. Having read the book in Spanish, let me assure you that these misspellings do not occur in Nettel’s original work. I also do not think typos–even if made by the author–devalue in any way the author’s quality: if so, I would level the same charge at you for having mistakenly written “I’m still INTERESTING in” , which is certainly a more gauche error than the misspelling of Santa Claus! Moreover, by focussing on the plot storyline of the book, you do not do justice to the brilliance of many of Nettel’s passages, and the exceptional low-key tone of her narrative voice. Her book is a literary achievement, both in its sharpness and honest insight, and its subtle style. Where the book falters—as you ably point out–is in the ending section, which loses the steam of the tautly rendered scenes in the beginning. Nonetheless, the scenes of the grandmother’s house, the relationship to the “eye”, the story of the girl across the road, and the amazing ability to capture the innocence and wariness of childhood were enough to make me read the book in Spanish, a fifth (and new) language for me, which meant I had to look up dozens of words on every page. With pleasure. 1) Having read the English version, that’s what I am analysing in my review. This is the book most of my readers will try, so it’s only natural that I will focus on that rather than on an original I haven’t read. 2) I find typos in most books I read (unfortunate, but unavoidable), so for me to have actually highlighted the issue in my post means that they must have been far more prevalent than is usually the case (again, I’m looking at this book and not the original version). Thank you for pointing out my own error – but might I say that I’m an amateur blogger with little or no time for text revision, and I’d expect far more from a professionally published book with (hopefully) an editor and proofreader. 3) The ‘brilliance’ of Nettel’s writing is very much in the eye of the beholder. Again, I was reading the translation, and while I recognised that there was some excellent writing there, I can’t say that it stood out as much for me as it did for you. Perhaps that was also partly a result of my not being grabbed by the subject matter. I would like to try another of Nettel’s books at some point, but as it’s been more than a year since my post and I haven’t got around to sourcing another one so far, you can see that the book simply wasn’t as enjoyable a work for me as it was for you. A fair response Tony, well-taken.